More systems are going to get higher, and more systems will be flipped in Amarr favor. And, if you then look at the future, we’re looking at a warzone where we’ll be gaining a high tier again. Everybody will be relaxing again and will be enjoying their time in a high tier and high isk, fill our wallets with billions of isk, and when it’s over, everyone will go back to tier one again and we’ll do the whole cycle again. But one thing we always seem to lack in a high tier is that we always go for the most important systems last… At around 15:00 Eve Time, we will begin assaulting Huola. Unofficial preparations began in earnest, with WINMATAR. logistics anchoring a POS in Huola as a secure safe and as a place to reship. 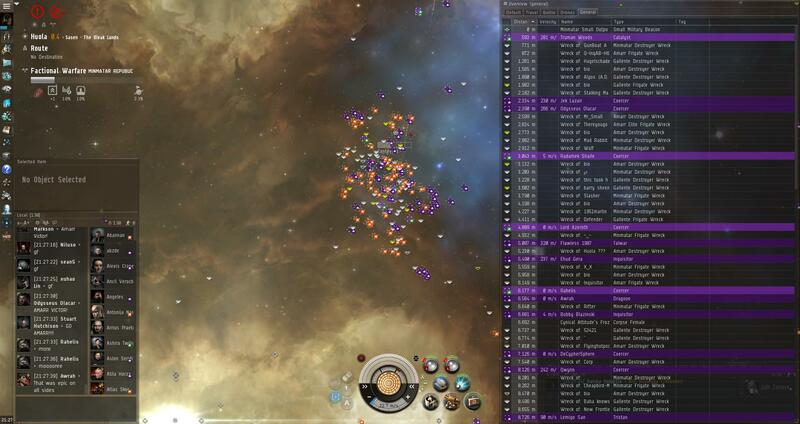 Indeed, a pilot need only d-scan in Huola to see the vast number of ships assembled for the ongoing siege. Other Amarrian entities such as Team Amarrica and J4LP have followed suit to provide their own pilots a similar area for staging, with smaller corporations continually encouraged to do the same. Importantly, in these initial phases, WINMATAR. pilots were ordered to be as stealthy as possible as the plexing commenced and the structures were anchored. Around this time, coalition forces noted that X Gallentius of Justified Chaos was in system and that he could rally a number of Gallente pilots to the defense of Huola. Attached as a frontline correspondent in the main WINMATAR. fleet aptly named “Burn Huola,” I can attest to the near-constant fighting that characterized the first day of the campaign. However, the initial phases of the campaign were unkind to Amarr forces. Attributed to this notorious reddit post, the 24th Imperial Crusade’s clandestine activities were blown into a full-scale operation once Minmatar pilots scrambled to the defense of the system. The first major engagement that I saw firsthand took place at 17:55 EVE Time on July 7, when an Amarrian cruiser fleet was defeated by heavy Minmatar ECM presence at a large compound. At around 18:41, an Amarrian Navy Augoror fleet supported by 6 Guardians was defeated by a Minmatar fleet of nearly 80 pilots, supplemented by 8 Guardians, 6 Exequrors, and a massive Russian Hurricane fleet. Facing the realities of Burn Huola, but nonetheless prepared for them, Aslon Seridith ordered the WINMATAR.-led fleet to stand down until 20:00, gambling on the Russian and other EU players logging off, allowing Amarrian US presence to take the field. After reforming, the Amarrian forces received their first great morale boost at around 21:30, holding a small plex–the wreckage was the first of many to begin littering the system. In the six subsequent–and consecutive–engagements, the Amarrian militia fleet held plex after plex, underscoring the value of frigate-sized logistics in novice and small complexes. By 00:21 of July 7, the makeup of the fighting had changed. Almost all major belligerents had put their cards on the table. Crusader forces had erected their POSes, neutral elements were flocking to the system like moths to a flame, and the Minmatar Huola defense coalition had onlined their mythical Erebus. As the Amarr militia forces from the US TZ reluctantly clambered off into the pains of necessary slumber, J4LP rose to the occasion and kept the system contested by expanding the Amarrian militia’s abilities to all plexes across the spectrum of size. To give a battle report of Huola would be near-impossible. The losses on both sides have been staggering in terms of ships destroyed. FCs in the WINMATAR.-led fleet have instructed pilots to stop linking killmails in fleet chat, simply because the sheer magnitude of killmails prevents coordination of logistics and non-essential fleet commands. Indeed, as a logistics pilot, I have received hundreds of ship destruction notifications as the fighting rages on. I’ll let the statistics speak for themselves. No Amarrian crusader ever possessed delusions that Huola would fall after a plexing effort of a mere three days. However, morale has ebbed and flowed with the contested percentage. The Minmatar EU presence has been particularly strong, easily outnumbering the combined Amarr militia forces by roughly forty pilots in this timezone, with defense forces drawn from the major Minmatar alliances and corporations such as Late Night Alliance, Iron Oxide, Ushra’Kan, Smile ‘n’ Wave, and a host of others. Standing against them are Amarrian pilots drawn from across the warzone: WINMATAR., Amarrian Vengeance, I Whip My Slaves Back and Forth, Shirak Skunworks, Sons of Liberty, Loaded Dice, 24eme Legion Etrangere, only to give a short list of the many that have flocked to the system heeding the call to arms. By July 10, after a cruiser fight at 01:30, in which J4LP Guardian and WINMATAR. T1 logistics broke under the weight of Minmatar forces cramming into a medium complex, the Amarrian forces shipped down into destroyers, contesting smaller plexes. An influx of Australian pilots from Black Watch Guard and Loaded Dice took up the mantle, bringing the contested percentage up to 20%. By 17:43, tactics have switched to a delay-style, with Amarrian EU forces contesting plexes just to draw out the timers in order to provide more buffer for the US players. The constant fighting has taken a toll on many militia members, with nonetheless humorous situations arising. For example, when the WINMATAR. POS password was changed, ejecting dozens of ships into space. Indeed, as the fighting grinds on in the trenches, neutral entities have begun to crop up in the system. For example, this Thanatos, although inexpensive for a ship of its class, was caught on the Huola-Kourmonen gate attempting to force a hotdrop. Minmatar coalition forces immediately deployed a mobile cyno jammer and even offered temporary blue status to Amarr militia simply to down the Pandemic Legion carrier. Huola shines as a beacon of destruction across New Eden and the only thing anyone can say with certainty, is that Huola Burns. Reginald Sakakibara is a relatively new player to both EvE and faction warfare, formerly fighting for Her Majesty as a member of Heart of Pyerite [NO45] in Imperial Outlaws. He continues to call the warzone his home, living in Kamela as a member of Death by Design [URGRD] within Did he say Jump. Imperial Remnant or Empire Strikes Back? Minmatar Proclaim Challenge: Auga As Next Battleground? Thank you very much for the feedback! There’s just so much going on in Huola and I’m happy to recount as much as I can. I agree, fantastic write up! I’m on the Minmatar side and have been a part of much of the fighting. It’s probably the most fun I’ve ever had in Eve, and I’ve certainly never logged as many consecutive hours as I have this week. The most even handed write up of huola I’ve seen. It’s been a blast, cheers the the amarr for bringing the fight. The galmil pilots and FCs who’ve come down also deserve a lot of credit. Gallente’s always been more cohesive than minmatar, and their logistical experience has been a big help in holding off the amarr push. It doesn’t hurt that they’re fun to fly with, as are the local pirates who’ve come in on the minmatar side. To say that this article is unbiased is a joke. This was written by Biohazard for pure Biohazard propaganda purposes and to pass this off as an balanced piece of work is a blatant lie. Let’s start with the implication that Aslon Seridith planned this operation. Bullsh*t, this was planned by Templar Dane, FHP and others in Amarrian Vengeance and I’m sure a few more besides. You are insulting these people making these claims and I can see why you doing it, you are preparing an exit strategy for Winmatar and this is short sighted face saving exercise with no regard for the long term relationships. Secondly what is this bullsh*t about a leak blowing the ‘claundestine activities’? The assault started at around 2100hr on Sunday evening. It was brilliantly timed to catch the strong Minmatar EU TZ too late in the night to react and then fall on the weaker US TZ and almost non-existant Aussie TZ coverage. It worked perfectly, caught us out completely and for almost 21 hours you had no opposition. It wasn’t until the EU TZ came back on line on Monday evening that the first significant Minmatar response occurred. By that time Huola was 40% contested. Stable to 40% contested in 21 hours! How thick do you think we are to suggest it took a cryptic leak in some forum to wake us up? ‘The Mythical Erebus’ What relevance has any Titan based in Huola made to this campaign? It can’t bridge people in. Do you think it is burning out of it’s POS shield to provide boosts? Then there is this pathetic attempt to portray the Minmatar as a bunch of blobby farmers who couldn’t punch their way out of wet paper bag. We have only succeeded (so far) due to the help of pirates, GalMil and massive numbers blobbing out the poor hard pressed leet Amarr small gangs. Our allies have responded magnificently, but the main burden has been shouldered by the Minmatar old guard. Yes there are a lot of farmers in the Minmatar, we have been at Tier 4 or 5 since about 2003. But how many of those farmers do you think came to defend Huola? There are blobs on both sides, quality on both sides and sh*te on both sides. Biohazard are the poor quality, sh*ty blob specialists, who thrived in the opening couple of days when it was generally 120 Amarr in system against 50 Minmatar. But now that the grind has sent in, the numbers have arrived on the other side, with some quality FCs to boot, Biohazard want out. We didn’t collapse in 36 hours did we? Lastly I point out the failure of the OP to report that at the time he posted his article, Huola had been driven back to stable. Major Trant – Iron Oxide, Minmatar Militia and totally biased with it. 1. I am not a member of Biohazard. I am a member of a corporation within the WINMATAR. alliance, and I believe that disclosure of that is given in my blurb at the bottom of the article. 2. If you read carefully, it does not at any point state that Aslon Seredith planned the operation. The article simply says that Aslon Seredith announced a Huola campaign to the WINMATAR. 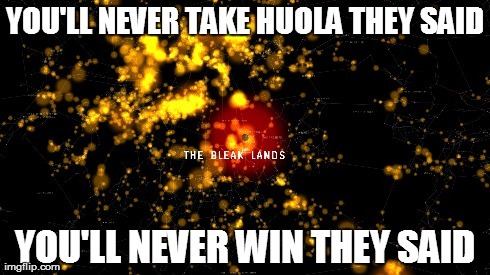 alliance on Sunday. In fact, no credit is given to anyone for planning the operation at all, though it is heavily implied that it was a coordinated effort across numerous Amarrian groups. I don’t like writing without certainty. 3. The effect of the reddit post is indeed debatable and I appreciate your viewpoint on the matter. Regardless, WINMATAR.’s intentions were to plex as much as possible without alerting Minmatar in system as far as that was feasible. Informal resistance sprung up quickly, but when pilots contacted me saying that they were logging back into EVE because of said reddit post, to say it had no effect is also misleading. 4. The “mythical Erebus” is a symbol of Minmatar resistance in Huola. While its tactical and strategic value seem limited to you, it is still nonetheless representative of defense efforts in Huola especially from the perspective of Amarrian pilots. During the last campaign in Huola, the Erebus provided boosts (unless the POS shield truly was dropped out of gross oversight). Moreover, the Erebus’ bonus is a role bonus of “7.5% bonus to fleet members’ maximum armor hitpoints [per skill level],” and therefore does not actually need to be outside of the POS in order to provide a massive hitpoint bonus to fleetmates as the ability is passive. However, even if I’m mistaken, then I completely agree with you that onlining an Erebus in Huola is a complete and absolute waste of time as it’s an insanely unnecessary action. 5. I’d like you to please point out where the blobbing comes in, because I feel like you’re reading far too much into a few sentences. For most of the events that I’ve written about, I was physically present on the battlefield, so it’s entirely possible that I missed coverage across timezones–I can’t stay up 23/7 following every little thing that goes on in Huola. As such, from my perspective, I saw a blob when six Guardians and numerous T1 logi overwhelmed a 30-person fleet at a large complex. 6. You clearly have some sort of vendetta against Biohazard. 7. Regarding my “failure” to post on Huola being stable or not, I provided a link to Huola statistics in DOTLAN, which is far more accurate than any “Huola is at X% or Stable” in a static article. 8. I recognize my limitations as the AMARR correspondent for FactionWarfare.com. I can’t cover both sides of the warzone in exactly the way that both sides would want to be covered at any point in time. I encourage any and all Minmatar pilots with writing talent to step up and join me as a colleague as a Minmatar correspondent, so that disputes such as these don’t occur in the future. I understand why Major Trant is upset, the situation in Huola is worrying. But to read his strong opinion about how it was organized. Let me do the honor of writing the two facts here that seem to be the most troublesome for him. 1. We planned this ‘assault’, on comms, amongst multiple alliances on sunday afternoon after Team Amarrica mailed us the green light they were ready. Every group organized it’s own deployment with WINMATAR. & Team Amarrica spearheading the command of fleets the first day. 2. We spread the 15:00 start during our alliance meeting as a decoy & formup time for our EUtz while in fact actually pushing few hours (22:00) after the alliance meeting. Which proved a big advantage, nobody saw it coming. It’s always a good day when someone shows Biohazard up. Pirate bro here. You also failed to report on the 35 minute brawl where we dunked you like Bryant dunks a first year draft pick. The article for that battle report is pending.